It's taken a while, but an actual workbench is now on the way. To put on it, at the recent Caufield Model Show I acquired a Mainline Jubilee body with Comet chassis pack and Fowler tender, and a Hornby Princess "Lady Patricia" also with Comet chassis. The Jubilee also came with a set of Alan Gibson wheels... in S4 gauge. Once I'm rid of these I shall get some in the proper gauge (not sure if Romfords would be better for a start) and work can properly commence on building. Some progress has been made on the A4 kit, with parts being filed and test fitted, but no actual construction has yet happened. A few months later, and little has changed. 37514 on it's last running at home had developed an odd scraping noise when going in one direction, so has been brought back to be serviced. 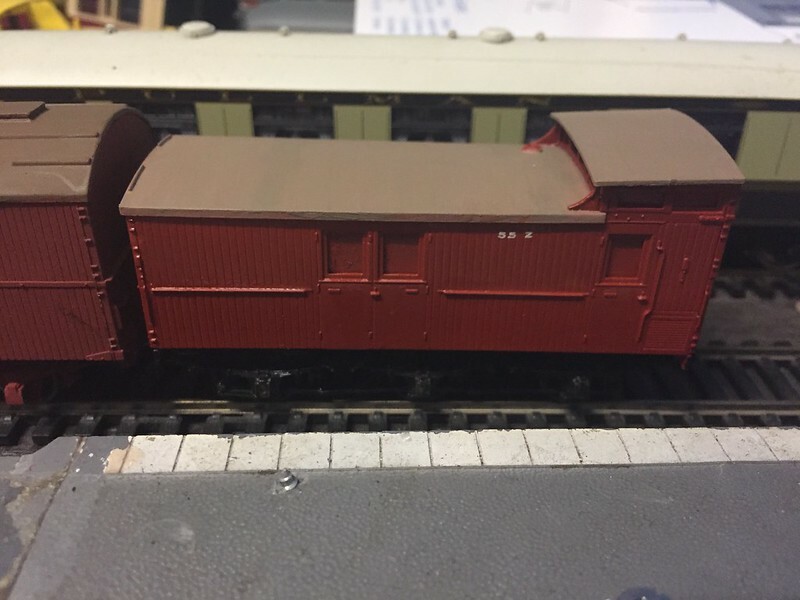 The Pendolino has now been sold, and on their way are a Lima GWR Parcels Railcar, and a poorly painted and built GWR Railcar kit in whitemetal, which will need a soak in turps to melt the glue and paint. I've had a look at the chassis packs for the Jubilee and Princess, and promptly decided that it may be better to start with a J72 for practice. In due course I will be ordering one. The T9 has recently come back to the front of my bench, and I've redecided that it will be motorised. I've ordered a Romford driver (it occurred to me that painting the frames without one will be fun), and will be finding a motor and gearbox at some point. I'm not at all happy with the boiler on it - now that I have a better idea of what I'm doing I've started noting all the problems with it, like the over-exuberent filing (including the handrail knob holes on one side and flat patches in places). Attaching the handrail knobs after gluing was also a bad idea. I also didn't file the join properly, so there is a slight gap between the halves. I'm tempted to remove the superglue and redo it. I also need crankpins. The A4 hasn't been touched for a while now - the Hornby (A1) chassis did fit, but would need a bit of fettling to be a good fit. I'm thinking it will become 60024 Kingfisher, probably in blue. The 4P is close to completion, with the electrics the main thing left to do. I found the original pony truck and have refitted it, as well as the motor retainer. The decoder is still lost, but I'll remove the plate from 5972 when I through-wire the decoder there and reinstall it here, where it originally came from. It's now holidays, so I may have some actual progress soon. "In another moment down went Alice after it, never once considering how in the world she was to get out again." 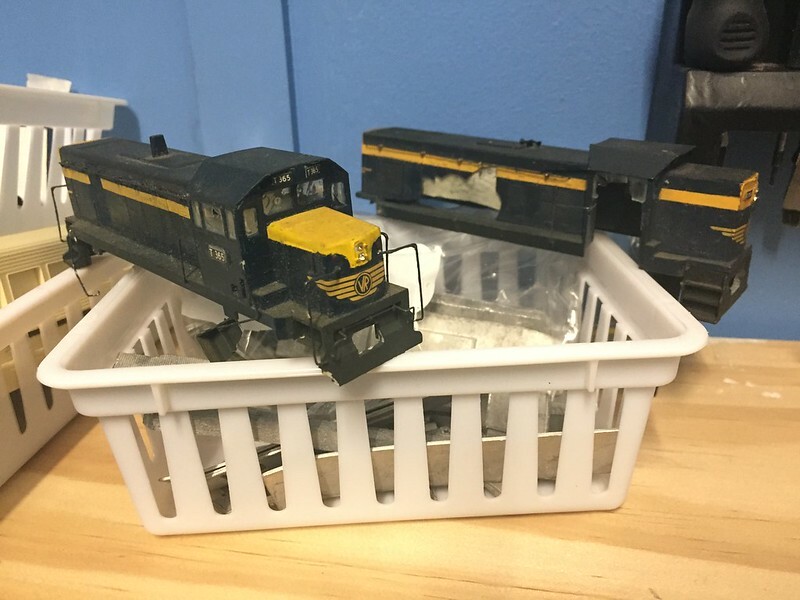 Upon looking at the pictures and some googling, it turns out the railcar kit I ordered may have actually been a K's kit, complete with (poorly running) motor bogie, which will need replacement. As well as this, the paint and glue (ohgodpleasebeglue) needs to be removed, somehow (suggestions?). Then the glazing is stuffed, so if the Flushglaze doesn't work for it, extra fun. I've read that the little windows are a great joy to do, so may need some of the stuff used for model aeroplane windows. Then there's the little matter of appropriate paint, and then transfers. Multiply this by three for the three kits that I currently own, and add extra for the two (soon to be three) chassis kits I have going, and my partner is in for a very unhappy year. On the plus side, I found some higher-grit sandpaper and have been going over the T9 with it. I also pulled out the A4 tender to start on, broke part of the main frame, and then decided I didn't really like the plastic wheels and would hold off until I had some proper ones (and some solder). It turns out the railcar kit was, in fact, by K's, and came with a Mk1 motor bogie which will have the motor replaced. Since then, there have been many attempts at removing the enamel paint - none have so far been successful. The glue, on the other hand, was removed quite easily. - 35028 has been brought back for overhaul. It turns out that in order to fit the sound decoder into the body, the weight inside the boiler has been removed. - 2 VR T Class (3rd series) kits have been purchased, one is partly assembled, and both require a chassis. - 1 Vline Sprinter (yes we have them too) body and chassis kit has been acquired. 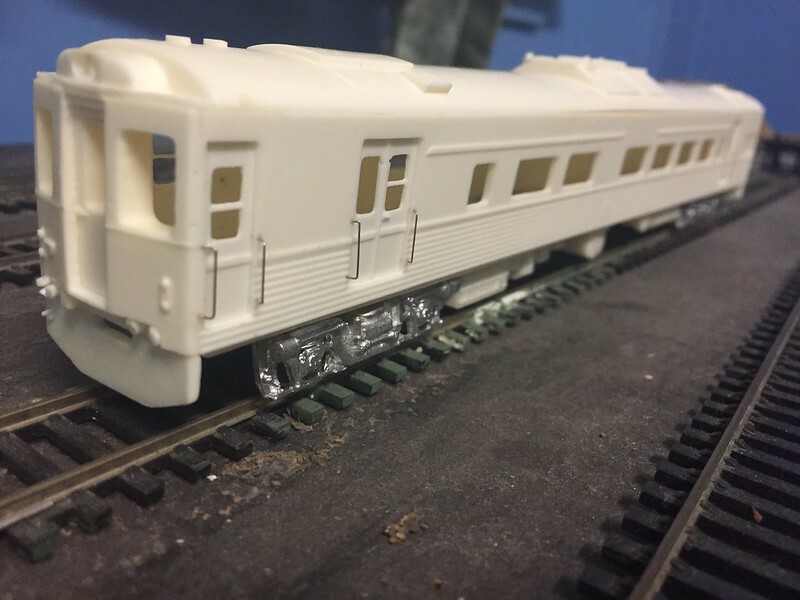 It is one of the Lyndon's Basic Australian Trains range, and is indeed very basic, albeit with a decent amount of detail for moulded resin. A good couple of hours was spent the other night clearing the windows of resin (tip: pin vise and small drill bit in each corner, then knife between holes.) An interior will need to be designed and constructed, and three of four drivers windows will need the 'strip' replaced. I also have to get the motor bogie, which costs more than the body kit). - 1 Queen Mary 2 kit (which looks very out of place) is waiting to be built. 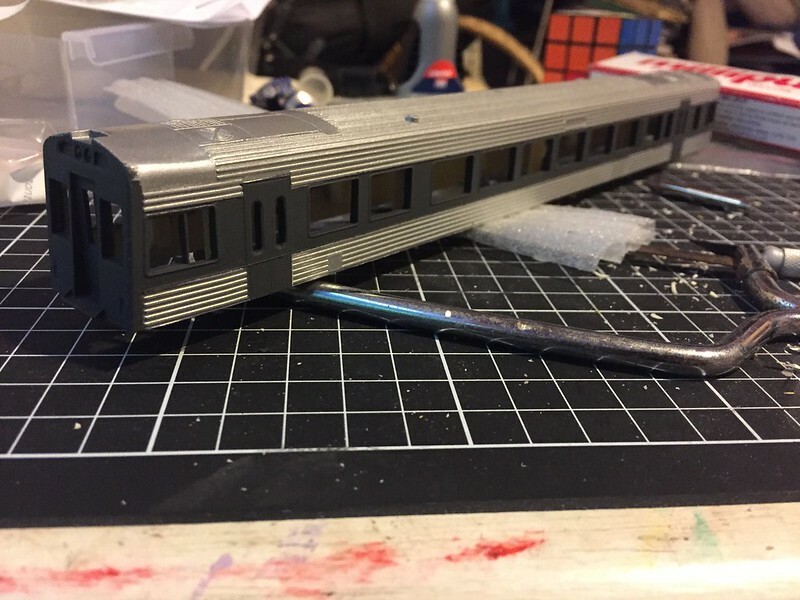 - 1 Austrains C Class diesel (C501 George Brown) has been purchased, and when it arrives will have the handrails corrected (C501 never had full width on the front, for those interested), lighting fitted if it isn't already, and a decoder fitted. - 1 kit built Adams Radial Tank has been purchased as a non runner. When it arrives I'll endeavour to fix it. And in the post this morning came both the Adams Radial and GNR 1247. 1247: way older than I thought. Still uses an X04 motor. It runs... Kind of. Not sure about it's future. Adams: not convinced that the poor running isn't due to the wheels being painted silver. Either that or they've oxidised badly. Motor runs reasonably well when directly connected, but I'm afraid to run it for too long on DCC. Well assembled and painted, more real than normal coal in the bunker, I just need to touch up the con-rods at some point. A very productive weekend, the first (and possibly last) in a long time. With recent events I haven't had access to my trains, let alone anywhere to work on them. - VR T class loco kit partially assembled. Roof and cab interior will have to be built and added later, and a chassis to be sourced. Still lots of filling and filing to do. This one will become T399 in VR blue and gold. I started on the other kit a while ago, but haven't been able to complete it. When it is complete, it will be T411, the first loco I drove. - More filing on the T9. Still have to work out how to remove the excessive glue globs on the tender. - Even more filing on the A4, so that the body halves actually fit together now. - The J72 chassis kit was taken out, the realisation was come to that I didn't buy any bloody bearings to use with it, and had no flux with me even if I did, and put back away again. C501 and 3520 haven't been out of the box other than for the preliminary look-over. 1247 has been sold, the sparking as it went around the corners was a little too concerning. Because I can't concentrate on one thing for long enough to complete it, I've also found an inexpensive, partially built SE Finecast King Arthur kit, which will become SR 740, Merlin. It comes complete with extra wheels and axles and detail parts. And because I have issues, I have purchased an MDC three-truck Shay kit. It's been taunting me from the other side of the room for the entire time I've been here, and I've had to fight the urge to just build it until I have the impossible to find (and more expensive than my uni textbooks for last semester) MDC Shay Handbook. This will be a companion to my little Keystone shay on a new little logging layout. I already have an idea for the engine shed area, but more on that later. In total, including chassis kits, I now have 12 (+) kits in various stages scattered around the place. In the last few trips home, I have purchased and mostly assembled a Diesel Rail Car from a Hanovale kit. Not a bad kit, just needs proper glazing and a couple of minor details. 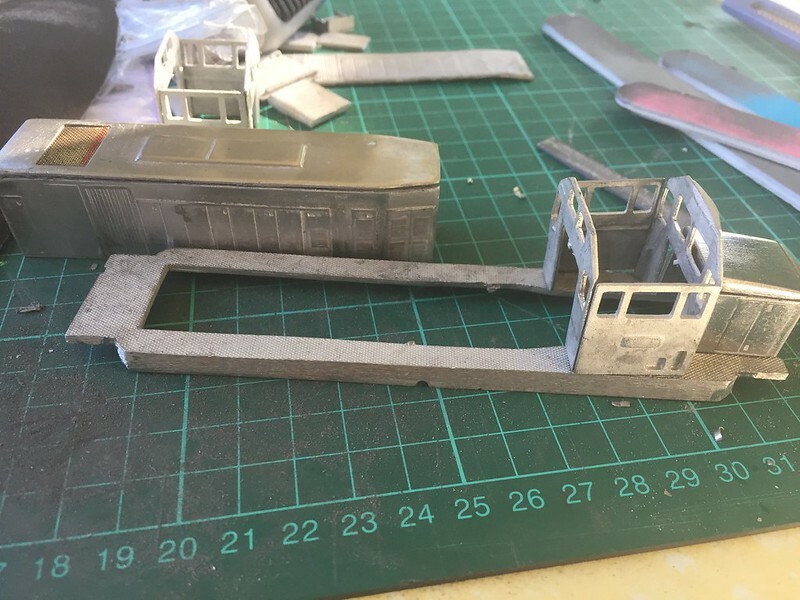 The Z guards van is mostly assembled, it just needs minor paint touch ups and fitting the running boards to the chassis. 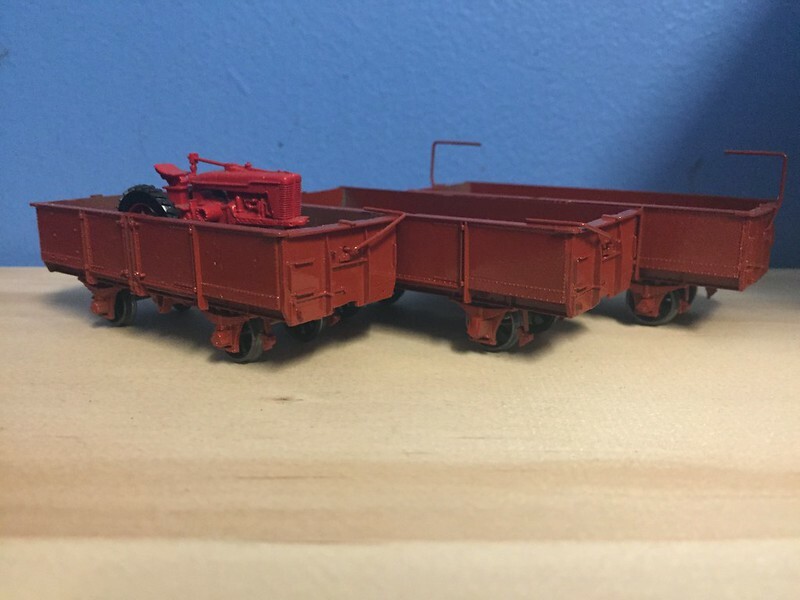 Three IY open wagons have been assembled and mostly painted, they just need decals added and a tarp for one of them. The J72 chassis has been started, the rear axle doesn't turn quite as freely as it should. My Hornby T9 has gone, since I have enough to be working on and at the moment I have more than enough locos. 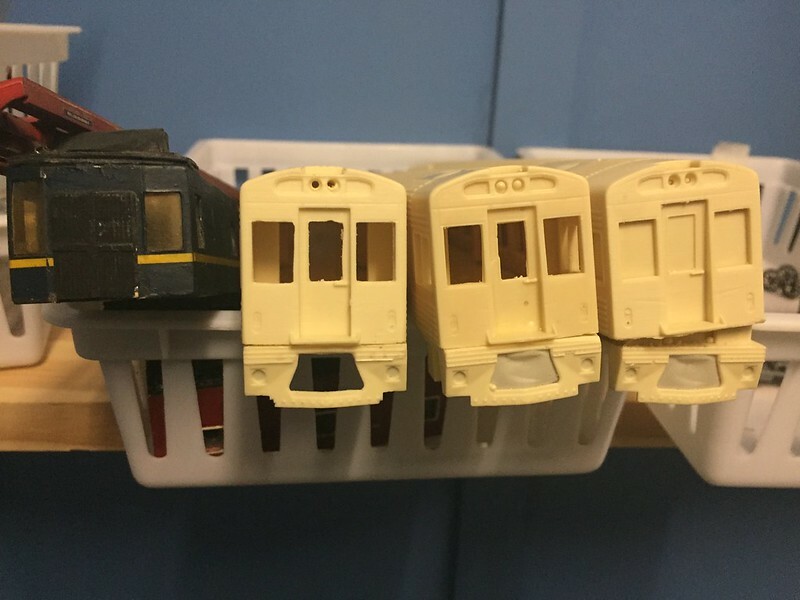 I also (still not sure why) purchased a lot of damaged locos off ebay, including 2 damaged T class, an A class shell which needs repainting (I'm deciding between A66 in current Vline, A60 in Vline blue and red, or A3? in Freight Australia green), a scratchbuilt DERM, G class and EL class, and various other bits and pieces. None of the above have a chassis either. 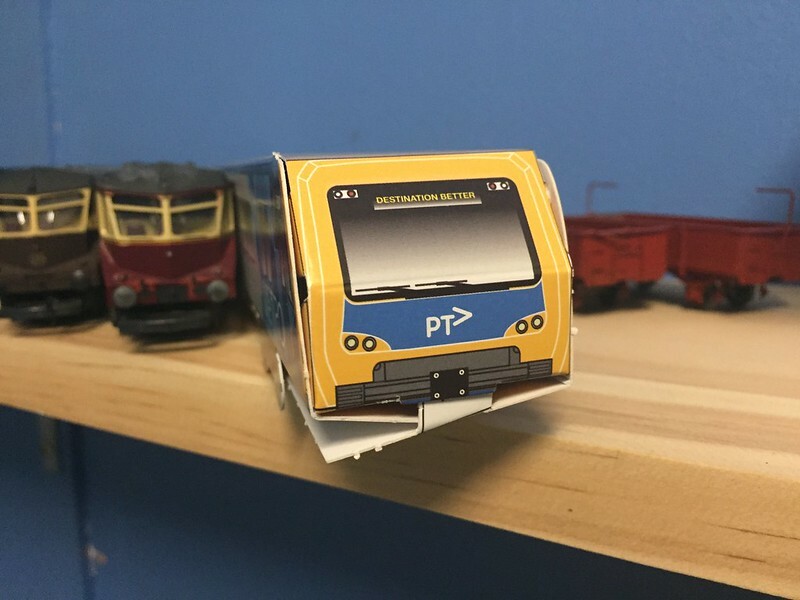 As well as that, I purchased two assembled Y class kits, with a very good Freight Australia livery, but everything else of questionable quality. E.g., the side cab windows were never cleared out and were simply painted black, and the taildisc, marker lights and brake pipes were drawn on with Sharpie. The bogies were also not able to turn in the body. Also they had been damaged at some point, so the steps and cowcatcher had snapped off. Finally, a Lima S302 body, with no chassis. 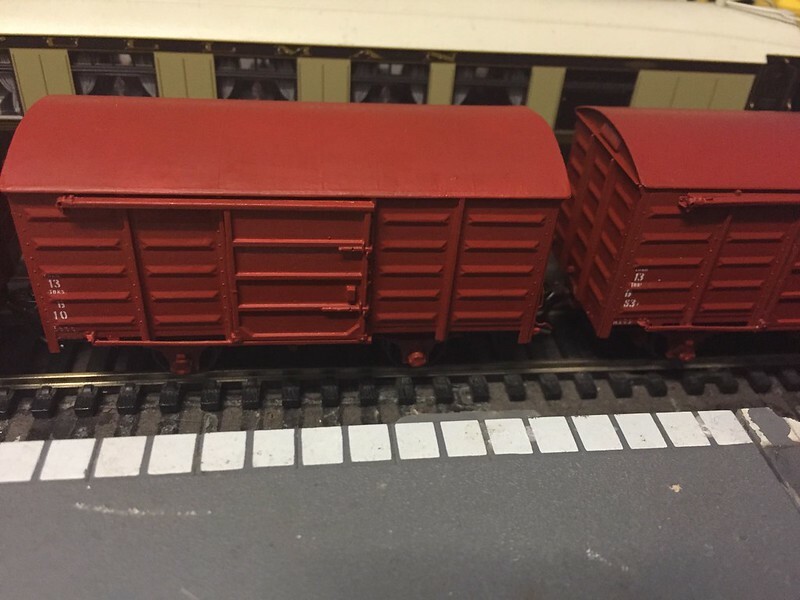 Fortunately, in my box of miscellania was found a suitable Lima chassis that was trimmed down at one end, and a set of bogies were stolen off a second Lima chassis from the box. 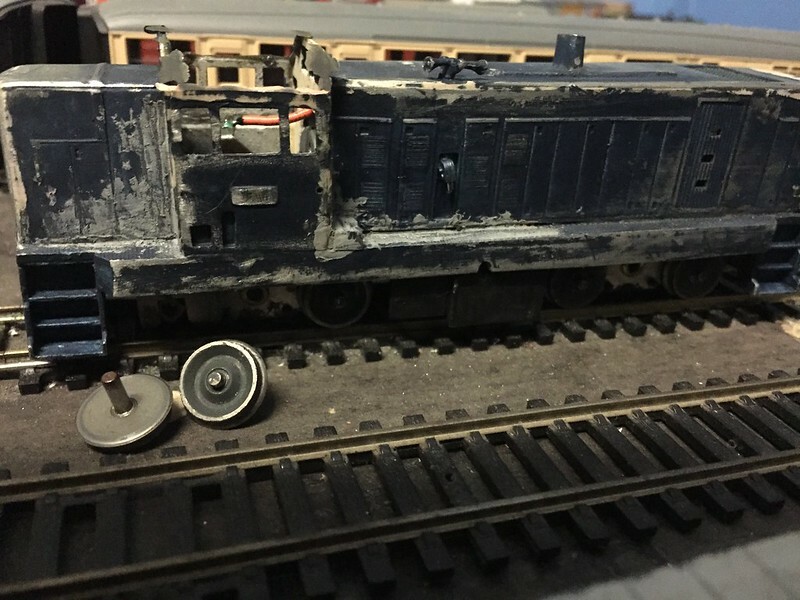 Still a bit of work needed, as the motor bogie doesn't turn properly in the gap.I will also obtain proper flushglaze for it, and new numberplates. This brings my VR loco list to: C501, S302, T411, T409, T3xx, T365, Y101, Y115, DRC42, and Sprinters 7019 'Danni Roche', 7010 'Andrew Gaze', and 7012 'Roy Higgins'. My motley T class fleet. 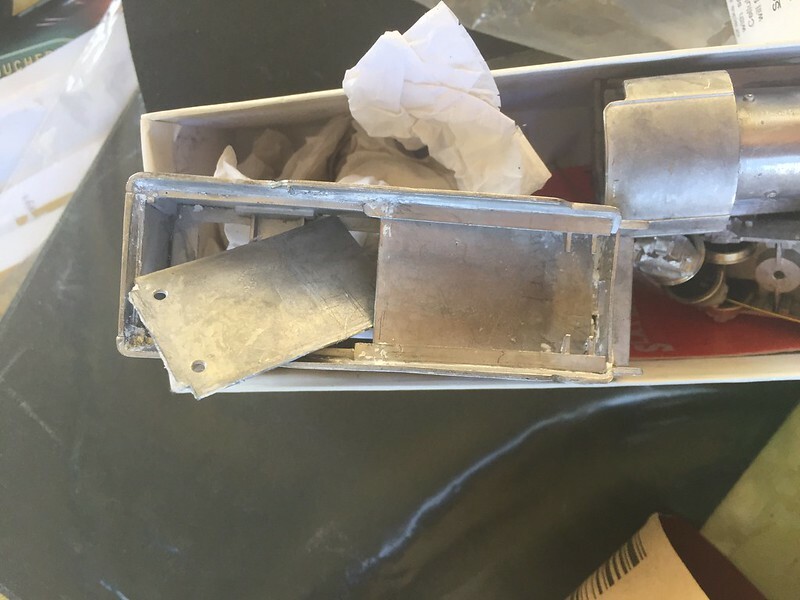 2 in pieces in the basket, 365 and the second-series T with severe damage because they were built with very thin polystyrene. And a very challenging Xtrapolis kit that required a huge amount of skill and effort. T411 is almost done, the three sections (short hood, long hood and cab) have been assembled (but not joined) and sanded nicely. T399 needs to be unglued and restarted, since I managed to get the short end sides back to front and the long end back to front and upside down. [url=https://flic.kr/p/R4Ne5q] I also had a go at the N15. It was to become Merlin, but the previous owner assembled it with the NBL-type roof, so it will be Sir Balin (my favourite of all the dwarves). Note that the sloping plate has been glued in too far back, so the top plate won't fit properly. The mould lines have been sanded smooth on the boiler and running plate. One of the splashers needs to be re-attached, the centre driving wheels changed out for a pair with flanges, and all the usual stuff. 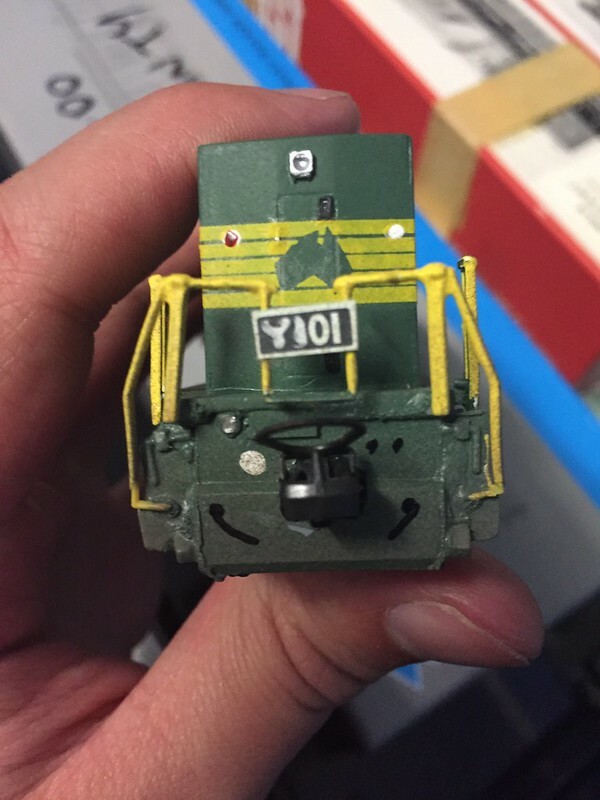 The order of assembly on this model is kinda weird, the dome has been attached before the boiler sanded down, and the coupler hook added to the tender before it's on its bogies or the coal area is properly assembled. The driving wheels have been painted and have crankpins (which need replacing on one side), but there's no motion gear in the kit. I also had a look at the Adams Radial, and gave it a quick wheel polish. I think the pickups need replacing. 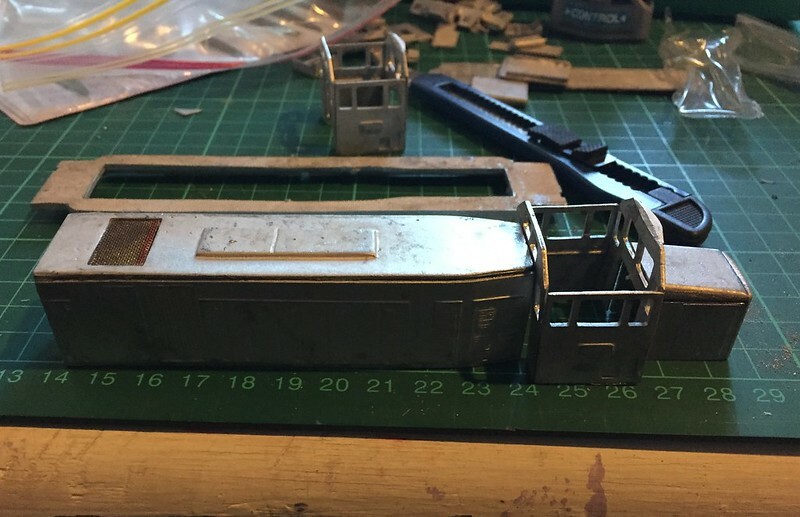 Sprinter 7019 is ready for lining. 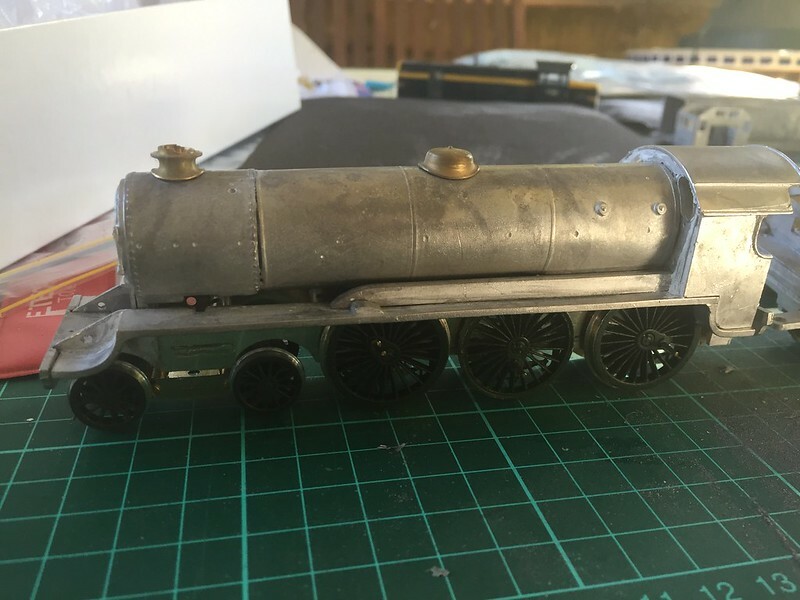 Still to do are find suitable horns, a motor bogie (within my budget of $10), and an interior. Three more kits have been ordered, for a total of 6 sprinters. This allows for one of each livery, with two spare. The three open wagons have been painted inside with Metalcote, could look better but its a start. 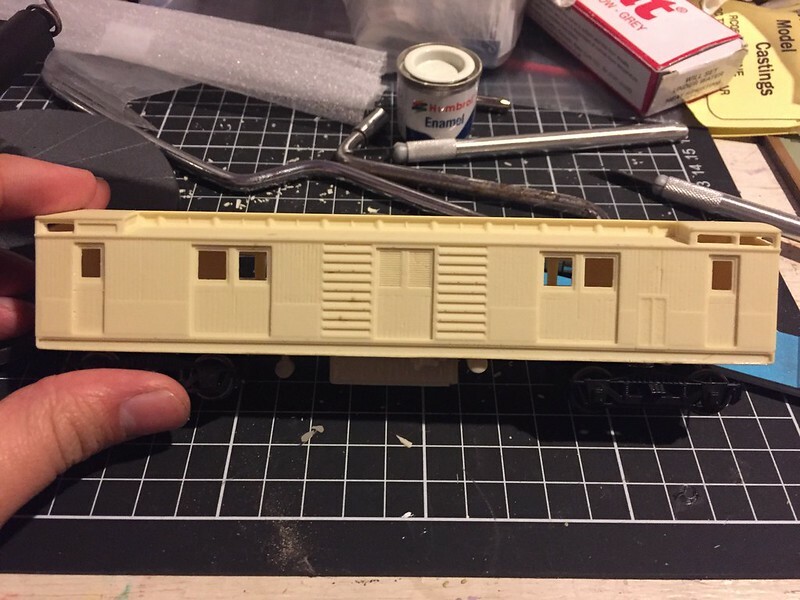 The CV guards van is coming along well, with the cupola windows mostly cleared out (took hours), and the sides looked like a group of bushrangers with shotguns had ambushed the train, so some of the more obvious holes have been filled in. The DRC has been filler-ed, and is almost ready for painting. Another T class kit had been ordered, this time a second series type with a chassis. Needs to be painted, but was otherwise assembled with a working chassis (until I dropped it, snapped an axle and dislodged something within the mechanism). S302 now moves almost properly, the chassis was warping so the rear was dremeled until a proper fit was achieved. A favourite chassis of mine that required very little modfication to fit the Lima GM classes (B, S, 42) was the Athearn SD9. Correct outline bogie sideframes were available to retrofit. This gave an almost indestructible chassis with excellent weight and traction and was simple to DCC. 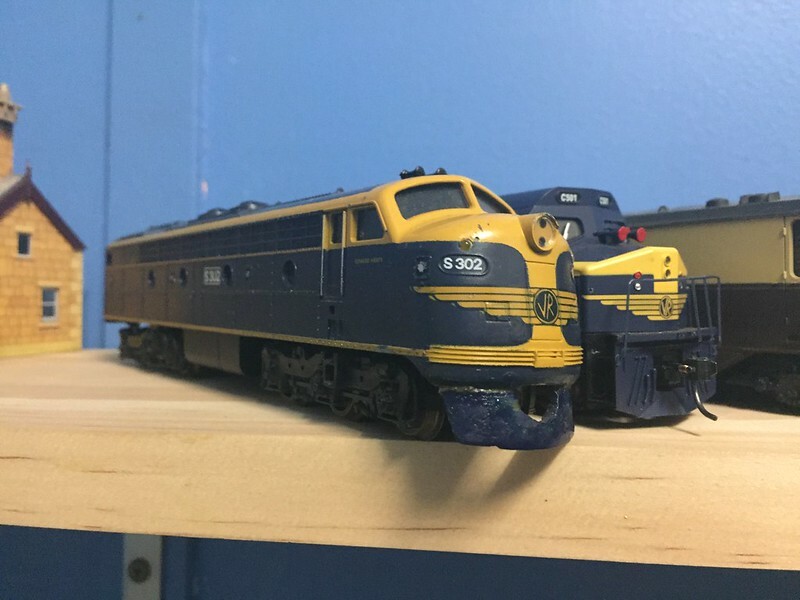 I converted over a dozen locomotives. Just because I haven't posted anything for a while doesn't mean I haven't done anything lately. It might be true, but it's no reason to assume it. Most of my time lately has revolved around the full-size scale models at the museum I volunteer at. At some point I'll have to look for a couple of SD9 chassis, as there are now 2 extra A class and the S class to re-chassis. The trimmed Lima chassis for S302 was not a success, and will need replacing. It is far too flexible. On the workbench (new policy: nothing new to be started until everything is finished) recently were the King Arthur and the T9 kits. Despite not having any attention for a while, an almost solid week of work saw them filled, drilled, sanded and primed, then re-sanded and re-primed. Both had the snifter valves attached, but I am tempted to fork out for a brass set for each, and a brass whistle to match. Both will be getting brass clack valves. Both tenders are almost ready for the first layer of Southern Railways Olive Green, once the rear corners have been touched up with filler. A bit more bodywork is required on both locos. 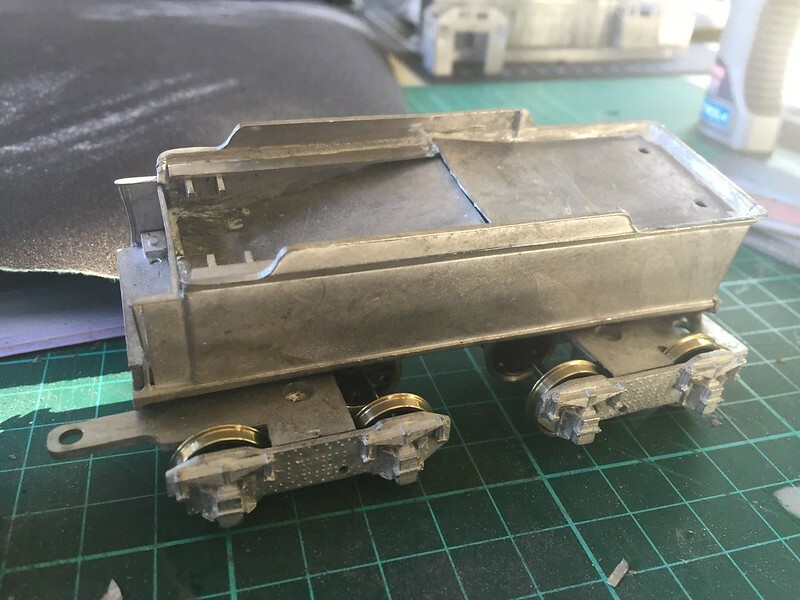 Once these are completed, the next projects will be the Princess class chassis, and the A4 Finecast kit which requires a chassis etc to be purchased. 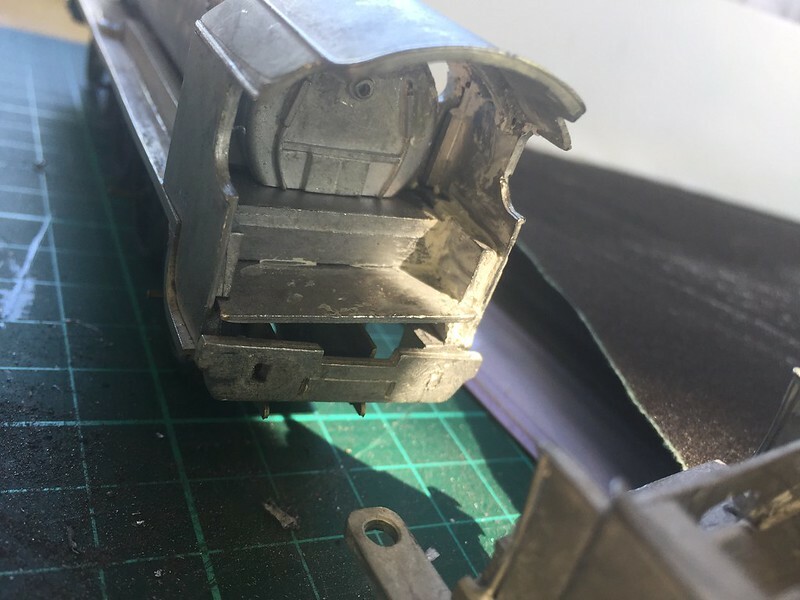 The T class that was dropped appears to have an Athearn chassis, and all that was damaged was the plastic gear holding the axle halves together. Easy fix. The body of this was also given some attention at the same time as the other whitemetal kits, and primed, but the finish has come out horrible. Lots more to be done on it. DRC 42 was filled properly, the top of one side unglued and reglued, then re-filled. Sadly I ran out of primer early on, and so there is now the appearance that undesirables have been to the carriage with a pack of matches. 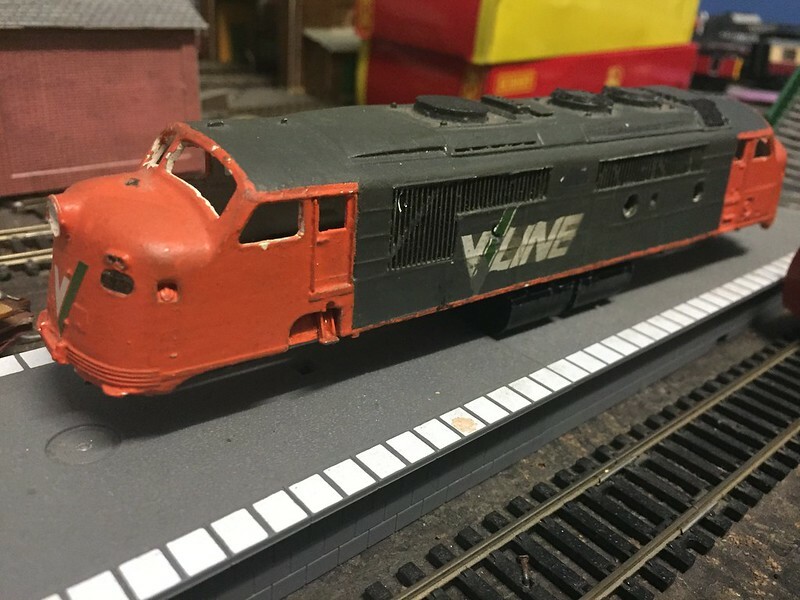 One of the Freight Australia Y class has been stripped with acetone, and will be repainted into Vline Passenger livery, to match 2 of the Sprinters and 2 of the 3 A class. Speaking of the Sprinters, I still have only 3, as the shop has not called to say the other 3 have arrived. Probably good, since I can't really afford it anyway at $85 each.